Waikato is cow country, or 'mooloo' to the locals. The climate is probably not conducive to producing the best from many grape varieties but grapes will grow anywhere. And so Romeo Bragato, New Zealand's first government viticulturist, set up his viticultural research station at Te Kauwhata, 2/3rds of the way from Auckland to Hamilton. "Why? ", many people asked, knowing how Bragato lectured on the best sites for growing grapes. "Because the rolling hills and the views over the lakes reminded him of his homeland, Italy! ", it is said. The first wines from Te Kauwhata were produced in 1903. Vines are still grown and wine is still produced in this important place in New Zealand's vinous history. In 2002, it celebrated its centenary and the original winery - now under the ownership of Babich Wines - was restored by the then owner, Rongapai Wines, to mark the occasion. A round trip tour from Auckland would take the curious wine lover who wants to visit wineries off the beaten track, to Te Kauwhata, then to the Central Waikato and then to Taupo, which is only one and a half hour's drive from Hawkes Bay. Return to Auckland, via Rotorua for the culture experience, then to Tauranga and travelling north via State Highway 2 for most of the way, detouring at Paeroa to take SH 26 to Thames. Opening hours checked when noted. Click on the website links provided to confirm opening hours. 55 Te Kauwhata Road, Te Kauwhata. Sold to Babich Wines in 2007 and the cellar door is currently closed. Hopefully it will re-open in some guise or other, as the historic buildings are those of the original Te Kauwhata Viticultural Research Station. There are other vineyards in the Te Kauwhata area but most are for contract growers for other producers, or are producing wines mostly for export. There are no other visitor facilities in Te Kauwhata at the time of this update. Pieter & Nelda Nooyen's Vilagrad Wines is the oldest Waikato winery still operating. It was established in 1922. From Hamilton, head east along Tuikaramea Road past the Morman Temple, then turn left into Rukuhia Road. They make a variety of wines, including Chardonnay, Malbec and Pinot Noir. Cellar shop is open 8.30am - 5.00pm from Monday to Friday as well as on Sundays between 10.30am - 4pm. Wine tastings ($10) by prior arrangement. Sunday lunches. Winery tours and tasting ($15) on Sundays between 3.30pm and 5.30pm. Bookings essential. The fourth generation Nooyen brothers have also established the 3 Brothers range of wines. Garry Major and Vicki Edwards produced their first commercially available wine from the 2000 vintage but what started as small production venture is now a major operation with a new winery built for the 2008 vintage. As well as grapes from the vineyard, grapes from other regions are utilised. Wines include Sauvignon Blanc, Chardonnay, Riesling, Gewurztraminer, Viognier, Rose, Pinot Noir and Syrah. Callar door is open weekends from Labour Weekend to Easter. Also on site is the Woodbox Winery Restaurant and Bar,which opened November 2007 and operates Wednesday through Sunday. Mystery Creek's wines, amongst ohers, feature on the wine list. Phone: (07) 823 6411 for bookings. Rainer Eschenbruch, former government scientist and winemaker at the former viticultural reseach station in Te Kauwhata, then with Rongopai Wines in Te Kauwhata, now grows grapes organically. He sells his wines at the local farmers' markets, including Raglan and Pirongia. A vineyard in Lyons Road, Mangatawhiri on the southern side of the Bombay Hills. No tasting facilities available here. The former De Redcliffe and Firstland labels from Hotel du Vin, further along Lyons Road, are no longer made. This winery, on the Ngati Maru Highway just south of Thames on the western entrance to the Coromandel Peninsula, has been there for as long as I can remember. There have been some good wines in the past, including a gold medal winning chardonnay from 1990, however nothing spectacular has been tasted of late. It's worth a visit on the trip to the Coromandel playground, however, and you can try their kiwifruit wines and liquers as well. The tasting room is open daily. Phone: (07) 868 6798. Checked 10/09. This is the love of Horst & Wendy Hillerich. It is in the unlikely setting near the Karangahake Gorge but the winery cafe provides a welcome travellers rest. You can find them off State Highway 2 in Moresby Street, Karangahake just out of Paeroa. Grapes are sourced from elsewhere. Open daily 10:00am to 5:00pm during the 'high summer' and Wednesday to Sunday the rest of the year. The distinctive winery, approximately 8 kilometres south of Katikati on State Highway 2, is open daily for tastings and sales with winery tours available by appointment. There is an extensive range of wines, mostly from Marlborough and Hawkes Bay grapes, although much of the wine is actually made here. Morton Estate also has an exciting range of Methode Traditionelle sparkling wines. Moffat Road, Bethlehem, on the northern approach to Tauranga. The 'art deco' style winery is open daily for tasting from 10 am until 5 pm. There is also a 150-seat a la carte restaurant on site. Most of the grapes are sourced from Hawkes Bay., although some are surced from Cooks Beach on the Coromandel Peninsula. Mills Reef makes some of the best red wines you'll find in New Zealand - the 'Reserve' range, in particular, incredible value for money. Grapes have been grown here since 1996 when the Shakepear Cliff Vineyard was developed with own vines and subdivison in mind. They achieved a gold medal and Bragato Wine Awards trophy for their Merlot from the 2007 Bragato Wine Awards. Mercury Bay Estate, previously known as Cook Beach Vineyard, took up one of the subdivions and now includes some of the former Shakespear Cliff vines. Open from 10.00am to 5.00pm daily during from Labour Weekend to Easter, and from 11.30 am to 4.00 pm daily for the rest of the year. Grapes are sourced from the estate and from Hawkes Bay and the wines are made at Mills Reef. 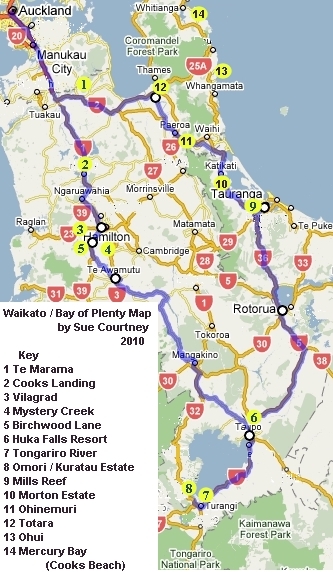 There is also Ohui Vineyard north of Whangamata (number 13 on map) and Lonely Bay Vineyard at Cooks Beach (number 14 on map) on the Coromandel Peninsula. Currently these vineyards have no tasting facilities. With views over the pinot noir vines, invite your clients, friends and family for a group wine tasting or dine downstairs in the private Cellar Room. The winery and private cellar is only available for private functions and there are no facilities for casual wine tasting. The vines at Huka Falls Resort produce a pinot noir (called Huka Block) which is sold from the restaurant. At the southern end of Lake Taupo, just north of Turangi township, Tongariro River Estate in Mill Lane off Grace Road opened their cellar door in December 2007 along with the River Winery Cafe, which re-opened in October 2010. They produce Pinot Gris, Pinot Noir and a Rose from this unlikely place for a vineyard. Opening hours are 10 am to 10 pm from Wednesday through Sunday, for lunch, bar snacks and dinner. About 1.5 kilometres from State Highway 41, at the southern end of Lake Taupo, west of Turangi township, Omori Estate grows grapes and olives. Wines include a Pinot Gris and a Pinot Noir Rose from their 'Omori Stream' block. Open in the afternoons from Christmas until Waitangi Weekend, or at other times of the year, by appointment. About 2.5 kilometres from State Highway 41 via Omori Road, Kuratau River Vineyard on the south west corner of lake Taupo, overlooks the Kurutau River. The vineyard was planted in 2004 with the first release wines from the 2007 vintage. The Floating Rock Cafe doubles as the tasting room. Currenly open daily during January and Fenruary from 10 am until 4 pm, seven days a week during school holidays and on public holidays, otehrwise by appointment.